Whether your filtration process includes wastewater treatment, water supply, food processing, pharmaceutical processing, chemical processing, or pigment and coating processes, Warwick has the technology and experience needed to fulfill your filtration fabric needs. We have broad experience in processing synthetic fibers. We can match fiber types and yarn polymers best suited to your filtration requirements, including olefin, fluorocarbon, aramid, polyethylene, nylon, and polyester, among others. With the ability to ply and weave all types of monofilament, multifilament, and staple yarns, we can produce advanced filtration fabrics that meet the performance requirements of your application. Our experienced engineering teams work closely with clients to understand their filtration processes and develop fabric that offers the flow rates, particle capture, chemical resistance, solids release, and durability they need to operate at maximum efficiency. Our full-service filter manufacturing includes scouring, heat setting, calendering, coating, laminating, slitting, and singeing. 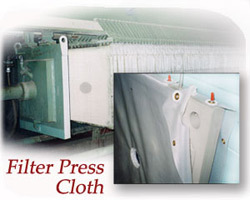 Our filtration fabrics provide the consistent results our customers demand. By working closely with our onsite laboratory, our technicians track process changes and effects to produce the highest quality filtration fabric available.